"Ferryman" redirects here. For other uses, see Ferryman (disambiguation). For other uses, see Ferry (disambiguation). A ferry is a merchant vessel used to carry passengers, and sometimes vehicles and cargo, across a body of water. A passenger ferry with many stops, such as in Venice, Italy, is sometimes called a water bus or water taxi. Ferries form a part of the public transport systems of many waterside cities and islands, allowing direct transit between points at a capital cost much lower than bridges or tunnels. Ship connections of much larger distances (such as over long distances in water bodies like the Mediterranean Sea) may also be called ferry services, especially if they carry vehicles. The profession of the ferryman is embodied in Greek mythology in Charon, the boatman who transported souls across the River Styx to the Underworld. Speculation that a pair of oxen propelled a ship having a water wheel can be found in 4th century Roman literature "Anonymus De Rebus Bellicis". Though impractical, there is no reason why it could not work and such a ferry, modified by using horses, was used in Lake Champlain in 19th-century America. See "When Horses Walked on Water: Horse-Powered Ferries in Nineteenth-Century America" (Smithsonian Institution Press; Kevin Crisman, co-authored with Arthur Cohn, Executive Director of the Lake Champlain Maritime Museum). See Experiment (horse powered boat). The Marine Services Company of Tanzania offers passenger and cargo services in Lakes Victoria, Tanganyika and Malawi. It also operates one of the oldest ferries in the region, the MV Liemba which was built in 1913 during the German colonial rule. The busiest seaway in the world, the English Channel, connects Great Britain and mainland Europe, with ships sailing mainly to French ports, such as Calais, Dunkirk, Dieppe, Roscoff, Cherbourg-Octeville, Caen, St Malo and Le Havre. Ferries from Great Britain also sail to Belgium, Denmark, the Netherlands, Norway, Spain and Ireland. Some ferries carry mainly tourist traffic, but most also carry freight, and some are exclusively for the use of freight lorries. In Britain, car-carrying ferries are sometimes referred to as RORO (roll-on, roll-off) for the ease by which vehicles can board and leave. MS Silja Symphony leaving Helsinki via the Kustaanmiekka strait to the Baltic Sea. The busiest single ferry route (at least in terms of the number of departures) is across the northern part of Øresund, between Helsingborg, Scania, Sweden and Elsinore, Denmark. Before the Øresund bridge was opened in July 2000, car and "car & train" ferries departed up to seven times every hour. In 2013, this has been reduced, but a car ferry still departs from each harbor every 15 minutes during daytime. The route is around 2.2 nautical miles (4.1 km; 2.5 mi) and the crossing takes 22 minutes. Today, all ferries on this route are constructed so that they do not need to turn around in the harbors. This also means that the ferries lack stems and sterns, since the vessels sail in both directions. Starboard and port-side are dynamic, depending on the direction the ferry sails. Despite the short crossing, the ferries are equipped with restaurants (on three out of four ferries), cafeteria, and kiosks. Passengers without cars often make a "double or triple return" journey in the restaurants; for this, a common single journey ticket is sufficient. Passenger and bicycle passenger tickets are inexpensive compared with longer routes. Large cruiseferries sail in the Baltic Sea between Finland, Åland, Sweden, Estonia, Latvia and Saint Petersburg, Russia and from Italy to Sardinia, Corsica, Spain and Greece. In many ways, these ferries are like cruise ships, but they can also carry hundreds of cars on car decks. Besides providing passenger and car transport across the sea, Baltic Sea cruise-ferries are a popular tourist destination unto themselves, with multiple restaurants, nightclubs, bars, shops and entertainment on board. Also many smaller ferries operate on domestic routes in Finland, Sweden and Estonia. The south-west and southern parts of the Baltic Sea has several routes mainly for heavy traffic and cars. The ferry routes of Trelleborg-Rostock, Trelleborg-Travemünde, Trelleborg-Świnoujście, Gedser-Rostock, Gdynia-Karlskrona, and Ystad-Świnoujście are all typical transports ferries. On the longer of these routes, simple cabins are available. The Rødby-Puttgarden route also transports day passenger trains between Copenhagen and Hamburg, and on the Trelleborg-Sassnitz route, it also has capacities for the daily night trains between Berlin and Malmö. In Istanbul, ferries connect the European and Asian shores of Bosphorus, as well as Princes Islands and nearby coastal towns. In 2014 İDO transported 47 million passengers, the largest ferry system in the world. MV Spirit of Vancouver Island en route to Tsawwassen from Swartz Bay. Route 1 is BC Ferries busiest route. Due to the numbers of large freshwater lakes and length of shoreline in Canada, various provinces and territories have ferry services. BC Ferries operates the third largest ferry service in the world which carries travellers between Vancouver Island and the British Columbia mainland on the country's west coast. This ferry service operates to other islands including the Gulf Islands and Haida Gwaii. In 2015, BC Ferries carried more than 8 million vehicles and 20 million passengers. Canada's east coast has been home to numerous inter- and intra-provincial ferry and coastal services, including a large network operated by the federal government under CN Marine and later Marine Atlantic. Private and publicly owned ferry operations in eastern Canada include Marine Atlantic, serving the island of Newfoundland, as well as Bay, NFL, CTMA, Coastal Transport, and STQ. Canadian waters in the Great Lakes once hosted numerous ferry services, but these have been reduced to those offered by Owen Sound Transportation and several smaller operations. There are also several commuter passenger ferry services operated in major cities, such as Metro Transit in Halifax, Toronto Island ferries in Toronto and SeaBus in Vancouver. The Spokane sailing from Edmonds to Kingston, one of ten routes served by Washington State Ferries. Washington State Ferries operates the most extensive ferry system in the continental United States and the second largest in the world by vehicles carried, with ten routes on Puget Sound and the Strait of Juan de Fuca serving terminals in Washington and Vancouver Island. In 2016, Washington State Ferries carried 10.5 million vehicles and 24.2 million riders in total. The Alaska Marine Highway System provides service between Bellingham, Washington and various towns and villages throughout Southeast and Southwest Alaska, including crossings of the Gulf of Alaska. AMHS provides affordable access to many small communities with no road connection or airport. The Staten Island Ferry in New York City, sailing between the boroughs of Manhattan and Staten Island, is the nation's single busiest ferry route by passenger volume. Unlike riders on many other ferry services, Staten Island Ferry passengers do not pay any fare to ride it. New York City also has a network of smaller ferries, or water taxis, that shuttle commuters along the Hudson River from locations in New Jersey and Northern Manhattan down to the midtown, downtown and Wall Street business centers. Several ferry companies also offer service linking midtown and lower Manhattan with locations in the boroughs of Queens and Brooklyn, crossing the city's East River. New York City Mayor Bill de Blasio announced in February 2015 that city would begin an expanded Citywide Ferry Service some time in 2017 linking heretofore relatively isolated communities such as Manhattan's Lower East Side, Soundview in The Bronx, Astoria and the Rockaways in Queens and such Brooklyn neighborhoods as Bay Ridge, Sunset Park, and Red Hook with existing ferry landings in Lower Manhattan and Midtown Manhattan. The New Orleans area also has many ferries in operation that carry both vehicles and pedestrians. Most notable is the Algiers Ferry. This service has been in continuous operation since 1827 and is one of the oldest operating ferries in North America. In New England, vehicle-carrying ferry services between mainland Cape Cod and the islands of Martha's Vineyard and Nantucket are operated by The Woods Hole, Martha's Vineyard and Nantucket Steamship Authority, which sails year-round between Woods Hole and Vineyard Haven as well as Hyannis and Nantucket. Seasonal service is also operated from Woods Hole to Oak Bluffs from Memorial Day to Labor Day. As there are no bridges or tunnels connecting the islands to the mainland, The Steamship Authority ferries in addition to being the only method for transporting private cars to or from the islands, also serves as the only link by which heavy freight and supplies such as food and gasoline can be trucked to the islands. Additionally, Hy-Line Cruises operates high speed catamaran service from Hyannis to both islands, as well as traditional ferries, and several smaller operations run seasonal passenger only service primarily geared towards tourist day-trippers from other mainland ports, including New Bedford, (New Bedford Fast Ferry) Falmouth, (Island Queen ferry and Falmouth Ferry) and Harwich (Freedom Cruise Line). Ferries also bring riders and vehicles across Long Island Sound to such Connecticut cities as Bridgeport and New London, and to Block Island in Rhode Island from points on Long Island. The San Francisco Bay Area has several ferry services, such as the Blue & Gold Fleet, connecting with cities as far as Vallejo. The majority of ferry passengers are daily commuters and tourists. A ferry serves Angel Island (which also accepts private craft). The only way to get to Alcatraz is by ferry. Until the completion of the Mackinac Bridge in the 1950s, ferries were used for vehicle transportation between the Lower Peninsula of Michigan and the Upper Peninsula of Michigan, across the Straits of Mackinac in the United States. Ferry service for bicycles and passengers continues across the straits for transport to Mackinac Island, where motorized vehicles are almost completely prohibited. This crossing is made possible by three ferry lines, Arnold Transit Company, Shepler's Ferry, and Star Line Ferry. Mexico also has ferry services run by Baja Ferries that connect La Paz located on the Baja California Peninsula with Mazatlán and Topolobampo. There are also passenger ferries that run from Playa del Carmen to the island of Cozumel. MS Spirit of Tasmania II at port in Devonport, Australia. In New Zealand, ferries connect Wellington in the North Island with Picton in the South Island, linking New Zealand's two main islands. The 92 kilometres (57 mi) route takes three hours, and is run by two companies – government-owned Interislander, and independent Bluebridge. A ferry underway in Penang, Malaysia. Hong Kong has the Star Ferry carry passengers across Victoria Harbour and various carriers carrying travellers between Hong Kong Island to outlying islands like Cheung Chau, Lantau Island and Lamma Island. The Malaysian state of Penang is home to the oldest ferry service in the country. This service, now renamed Rapid Ferry, connects the Raja Tun Uda Ferry Terminal at Weld Quay in George Town on Penang Island with the Sultan Abdul Halim Ferry Terminal in Butterworth on Peninsular Malaysia. It has also become a tourist attraction among foreigners. India's ro-ro ferry service between Ghogha and Dahej was inaugurated by Prime Minister Narendra Modi on 22 October 2017. It aims to connect South Gujarat and Saurashtra currently separated by 360 km of roadway to 31 km of ferry service. It is a part of the larger Sagar Mala project. Water transport in Mumbai consists of ferries, hovercrafts, and catamarans, operated by various government agencies as well as private entities. The Kerala State Water Transport Department (SWTD), operating under the Ministry of Transport, Government of Kerala, India regulates the inland navigation systems in the Indian state of Kerala and provides inland water transport facilities. It stands for catering to the passenger and cargo traffic needs of the inhabitants of the waterlogged areas of the Districts of Alappuzha, Kottayam, Kollam, Ernakulam, Kannur and Kasargode. SWTD ferry service is also one of the most affordable modes to enjoy the beauty of the scenic Kerala backwaters. Ferry designs depend on the length of the route, the passenger or vehicle capacity required, speed requirements and the water conditions the craft must deal with. Double-ended ferries have interchangeable bows and sterns, allowing them to shuttle back and forth between two terminals without having to turn around. Well-known double-ended ferry systems include the Staten Island Ferry, Washington State Ferries, Star Ferry, several boats on the North Carolina Ferry System, and the Lake Champlain Transportation Company. Most Norwegian fjord and coastal ferries are double-ended vessels. All ferries from southern Prince Edward Island to the mainland of Canada are double-ended. Some ferries in Sydney, Australia and British Columbia are also double-ended. In 2008, BC Ferries launched three of the largest double-ended ferries in the world. Hydrofoils have the advantage of higher cruising speeds, succeeding hovercraft on some English Channel routes where the ferries now compete against the Eurotunnel and Eurostar trains that use the Channel Tunnel. Passenger-only hydrofoils also proved a practical, fast and relatively economical solution in the Canary Islands but were recently replaced by faster catamaran "high speed" ferries that can carry cars. Their replacement by the larger craft is seen by critics as a retrograde step given that the new vessels use much more fuel and foster the inappropriate use of cars in islands already suffering from the impact of mass tourism. Hovercraft were developed in the 1960s and 1970s to carry cars. The largest was the massive SR.N4 which carried cars in its centre section with ramps at the bow and stern between England and France. The hovercraft was superseded by catamarans which are nearly as fast and are less affected by sea and weather conditions. Only one service now remains, a foot passenger service between Portsmouth and the Isle of Wight run by Hovertravel. Since 1990 high speed Catamarans have revolutionised ferry services, replacing hovercraft, hydrofoils and conventional monohull ferries. In the 1990s there were a variety of builders, but the industry has consolidated to two builders of large vehicular ferries between 60 and 120 metres. Incat of Hobart, Tasmania favours a Wave-piercing hull to deliver a smooth ride, while Austal of Perth, Western Australia builds ships based on SWATH designs. Both these companies also compete in the smaller river ferry industry with a number of other ship builders. Stena Line once operated the largest catamarans in the world, the Stena HSS class, between the United Kingdom and Ireland. These waterjet-powered vessels, displaced 19,638 tonnes, accommodating 375 passenger cars and 1,500 passengers. Other examples of these super-size catamarans are found in the Brittany Ferries fleet with the Normandie Express and the Normandie Vitesse. Roll-on/roll-off ferries (RORO) are large conventional ferries named for the ease by which vehicles can board and leave. A cruiseferry is a ship that combines the features of a cruise ship with a roll-on/roll-off ferry. They are also known as RoPax for their combined Roll on/Roll Off and passenger design. Fast RoPax ferries are conventional ferries with a large garage intake and a relatively large passenger capacity, with conventional diesel propulsion and propellers that sail over 25 knots (46 km/h; 29 mph). Pioneering this class of ferries was Attica Group, when it introduced Superfast I between Greece and Italy in 1995 through its subsidiary company Superfast Ferries. Cabins, if existent, are much smaller than those on cruise ships. This type of ferry allows vehicles to load from the "side". The vehicle platform can be turned. When loading, the platform is turned sideways to allow sideways loading of vehicles. Then the platform is turned back, in line with the vessel, and the journey across water is made. The Lower Kingswear to Dartmouth ferry, Devon, England. The pontoon carries eight cars and is towed across the River Dart by a small tug. Two ropes connect the tug to the pontoon. Pontoon ferries carry vehicles across rivers and lakes and are widely used in less-developed countries with large rivers where the cost of bridge construction is prohibitive. One or more vehicles are carried on a pontoon with ramps at either end for vehicles to drive on and off. Cable ferries (next section) are usually pontoon ferries, but pontoon ferries on larger rivers are motorised and able to be steered independently like a boat. A train ferry is a ship designed to carry railway vehicles. 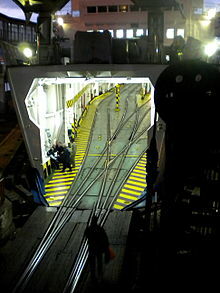 Typically, one level of the ship is fitted with railway tracks, and the vessel has a door at the front and/or rear to give access to the wharves. Foot ferries are small craft used to ferry foot passengers, and often also cyclists, over rivers. These are either self-propelled craft or cable ferries. Such ferries are for example to be found on the lower River Scheldt in Belgium and in particular the Netherlands. Regular foot ferry service also exists in the capital of the Czech Republic, Prague, and across the Yarra River in Melbourne, Australia at Newport. Restored, expanded ferry service in the Port of New York and New Jersey uses boats for pedestrians only. Very short distances may be crossed by a cable or chain ferry, which is usually a pontoon ferry (see above), where the ferry is propelled along and steered by cables connected to each shore. Sometimes the cable ferry is human powered by someone on the boat. Reaction ferries are cable ferries that use the perpendicular force of the current as a source of power. Examples of a current propelled ferry are the four Rhine ferries in Basel, Switzerland. Cable ferries may be used in fast-flowing rivers across short distances. With an ocean crossing of approximately 1900 metres, the cable ferry between Vancouver Island and Denman Island in British Columbia; is the longest one in the world. Free ferries operate in some parts of the world, such as at Woolwich in London, England (across the River Thames); in Amsterdam, Netherlands (across the IJ waterway); along the Murray River in South Australia, and across many lakes in British Columbia. Many cable ferries operate on lakes and rivers in Canada, among them a cable ferry that charges a toll operates on the Rivière des Prairies between Laval-sur-le-Lac and Île Bizard in Quebec, Canada. In Finland there were 40 road ferries (cable ferries) in 2009, on lakes, rivers and on sea between islands. In the 1950s and 1960s, travel on an "air ferry" was possible—airplanes, often ex-military, specially equipped to take a small number of cars in addition to foot passengers. These operated various routes including between the United Kingdom and Continental Europe. Companies operating such services included Channel Air Bridge, Silver City Airways, and Corsair. The term is also applied to any "ferrying" by air, and is commonly used when referring to airborne military operations. Ferry boats often dock at specialized facilities designed to position the boat for loading and unloading, called a ferry slip. If the ferry transports road vehicles or railway carriages there will usually be an adjustable ramp called an apron that is part of the slip. In other cases, the apron ramp will be a part of the ferry itself, acting as a wave guard when elevated and lowered to meet a fixed ramp at the terminus — a road segment that extends partially underwater. The world's largest ferries are typically those operated in Europe, with different vessels holding the record depending on whether length, gross tonnage or car vehicle capacity is the metric. On 11 October 1811, inventor John Stevens' ship the Juliana, began operation as the first steam-powered ferry (service was between New York City, and Hoboken, New Jersey). The Elwell Ferry, a cable ferry in North Carolina, travels a distance of 110 yards (100 m), shore to shore, with a travel time of five minutes. A contender as oldest ferry in continuous operation is the Mersey Ferry from Liverpool to Birkenhead, England. In 1150, the Benedictine Priory at Birkenhead was established. The monks used to charge a small fare to row passengers across the estuary. In 1330, Edward III granted a charter to the Priory and its successors for ever: "the right of ferry there… for men, horses and goods, with leave to charge reasonable tolls". However, there may have been a short break following the Dissolution of the monasteries. Another claimant as the oldest ferry service in continuous operation is the Rocky Hill - Glastonbury Ferry, running between the towns of Rocky Hill and Glastonbury, Connecticut. Established in 1655, the ferry has run continuously since, only ceasing operation every winter when the river freezes over. A long running salt water ferry service is the Halifax/Dartmouth ferry, running between the cities of Halifax and Dartmouth, Nova Scotia, which has run year-round since 1752, and is currently run by the region's transit authority, Metro Transit. However the Mersey Ferry predates it as the oldest salt water ferry. By far the largest commuter ferry system in the world is the Ferries in Istanbul, Turkey, operated by İDO with 87 vessels serving 86 ports of call. Another two of the world's large ferry systems are located in the Strait of Georgia, in the Canadian province of British Columbia, and Puget Sound, in the U.S. state of Washington. BC Ferries in British Columbia operates 36 vessels, visiting 47 ports of call, while Washington State Ferries owns 28 vessels, travelling to 20 ports of call around Puget Sound. On the west coast of Scotland, Caledonian MacBrayne operate a network calling at 50 ports using a fleet of 31 vessels, 10 of which are 80m or longer. This includes a high proportion of lifeline services to island communities and as such most of the routes are heavily subsidised by the government. Sydney Ferries in Sydney, Australia operates 31 passenger ferries in Port Jackson (Sydney Harbour), carrying 18 million passengers annually. It operates catamarans and other types of ferries on these routes, including the Circular Quay-Manly route. Between 1938 and 1974 this route operated the South Steyne, billed at the time as the largest and fastest ferry of its type. Sydney Ferries became an independent corporation owned by the government in 2004. Some of world's busiest ferry routes include the Star Ferry in Hong Kong and the Staten Island Ferry in New York City. Metrolink Queensland operates 21 passenger ferries on behalf of Brisbane City Council, 12 being single-hulled ferries and 9 CityCats (catamarans), along the Brisbane River from the University of Queensland through the city to Brett's Wharf. The gas turbine powered Luciano Federico L operated by Montevideo-based Buquebus, holds the Guinness World Record for the fastest car ferry boat in the world, in service between Montevideo, Uruguay and Buenos Aires, Argentina: its maximum speed, achieved in sea trials, was 60.2 knots (111.5 km/h; 69.3 mph). It can carry 450 passengers and 52 cars along the 110-nautical-mile (200 km; 130 mi) route. Fast Ro-Pax ferries, like MS Star, have also notable CO2 emissions. The contributions of ferry travel to climate change have received less scrutiny than land and air transport, and vary considerably according to factors like speed and the number of passengers carried. Average carbon dioxide emissions by ferries per passenger-kilometre seem to be 0.12 kg (4.2 oz). However, 18-knot ferries between Finland and Sweden produce 0.221 kg (7.8 oz) of CO2, with total emissions equalling a CO2 equivalent of 0.223 kg (7.9 oz), while 24–27-knot ferries between Finland and Estonia produce 0.396 kg (14.0 oz) of CO2 with total emissions equalling a CO2 equivalent of 0.4 kg (14 oz). With the price of oil at high levels, and with increasing pressure from consumers for measures to tackle global warming, a number of innovations for energy and the environment were put forward at the Interferry conference in Stockholm. According to the company Solar Sailor, hybrid marine power and solar wing technology are suitable for use with ferries, private yachts and even tankers. Megawatt-class battery electric ferries operate in Scandinavia, with several more scheduled for operation. Alternative fuels are becoming more widespread on ferries. The fastest passenger ferry in the world Buquebus, runs on LNG, while Sweden's Stena plans to operate its 1500-passenger ferries on methanol in 2015. Both fuels reduce emissions considerably and displace costly diesel fuel. Since 2015, Norwegian ferry company Norled has operated the electrical car ferry "MF Ampere" on the Lavik-Opedal connection on the E39 north of Bergen. The connection Anda-Lote, further north on the Norwegian west coast, will be the world's first connection served only by electrical car ferries. The first of the two ships, "MF Gloppefjord", was put into operation in January 2018. The owner, Fjord1, has commissioned a further seven battery-powered ferries to be in operation from 2020. The following notable maritime disasters involved ferries. ^ "in Swedish, "Vi seglar var 15:e minut" means "We sail every 15 minutes"". Hhferries.se. Retrieved 27 January 2018. ^ Starr, Stephen (28 May 2015). "Istanbul shows ferries have a future". The Guardian. Retrieved 27 January 2018. ^ "ANNUAL REPORT 2015–2016 : BRITISH COLUMBIA FERRY SERVICES INC. & B.C. FERRY AUTHORITY" (PDF). Bcferries.com. Retrieved 27 January 2018. ^ "WSDOT Ferries Division : NATION'S LARGEST FERRY SYSTEM" (PDF). Wsdot.wa.gov. December 2016. Retrieved 27 January 2018. ^ "Washington State Ferries : Traffic Statistics Rider Segment report" (PDF). Wsdot.wa.gov. 2016. Retrieved 27 January 2018. ^ "Why Gujarat's Ro-Ro ferry is a revolutionary step for Indian economy". The Economic Times. 22 October 2017. Retrieved 22 October 2017. ^ "ATAN official web page: Fast Ferries - pointless gas-guzzlers". Atan.org. Retrieved 27 January 2018. ^ "Fähri Verein Basel". Faehri.ch. Retrieved 27 January 2018. ^ "Hoboken Historical Museum - Steamboat Innovation". Hobokenmuseum.org. Archived from the original on 7 May 2016. Retrieved 5 April 2017. ^ "Elwell Ferry, Kelly, NC". Living in Style, August/September 2008, Christopher E. Nelson. ^ "Elwell Ferry: When getting 'away' is closer than you think". Star News Online, Jim Hanchett, 2 December 2005. ^ "101 Interesting Facts". Mersey Ferries. Archived from the original on 4 September 2010. Retrieved 30 May 2013. ^ Transportation, Department of. "Department of Transportation". Ct.gov. Retrieved 27 January 2018. ^ "Halifax Regional Municipality (Metro Transit) page – "Harbour Ferries"". Halifax.ca. Archived from the original on 3 June 2011. Retrieved 27 January 2018. ^ "Luciano Federico L -". ship-technology.com. ^ "AMD 1130 - "Luciano Federico L"". Amd.com.au. Retrieved 27 January 2018. ^ Philippe Holthof (10 April 2009). "'SOx and CO2 Emissions once again Hot Topic at Ferry Shipping Conference' : Ferry Shipping Conference 08: Building Bridges in the Industry" (PDF). Shippax.se. p. 3. Retrieved 27 January 2018. ^ "Interferry hears about green alternatives". Tmcnet.com. Retrieved 27 January 2018. ^ "VIDEO: Plugging in Finland's first electric ferry - Marine Log". Marinelog.com. 20 November 2017. Retrieved 4 December 2017. ^ "Stena to operate 1,500 passenger ferry on methanol - Marine Log". Marinelog.com. Retrieved 4 December 2017. ^ "Fjord 1 orders seven electric ferries from Havyard - electrive.com". electrive.com. 8 March 2018. Retrieved 24 March 2018. Rines, George Edwin, ed. (1920). "Ferry" . Encyclopedia Americana. Robins, Nick (1996). The Evolution of the British Ferry. Kilgetty, Pembrokeshire: Ferry Publications. ISBN 1871947316. Wikimedia Commons has media related to Ferry. Wikivoyage has a travel guide for Ferries. "Ferry" . Encyclopædia Britannica (11th ed.). 1911.